How do my customers purchase a gift card through the system? If you have created gift cards in your system, then you can allow your customers to purchase a gift card directly through the online booking calendar. 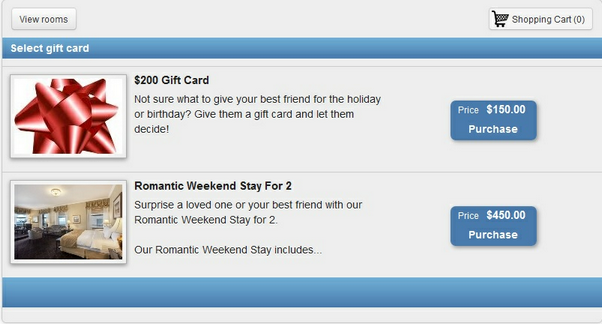 In addition, you can also purchase a gift card on behalf of a customer through Frontdesk. 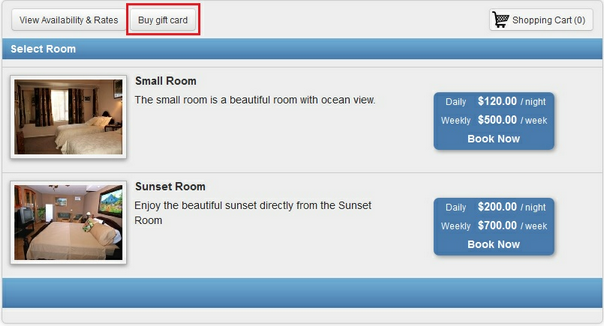 Gift cards for purchase are automatically shown in your booking calendar / shopping cart. On the initial product listing page, customers will be able to click on the button, Buy gift card, to purchase the gift card. On the gift card page, the customer will choose the gift card option they would like to purchase. When a customer selects a gift card for purchase, the customer will see the details about the gift card and be given instructions on how to purchase. This includes entering the recipient's name, short message, and who the card is from. The customer will be taken through the regular checkout process. After they click to purchase the gift card, the customer will be emailed the gift card certificate. Customers should then either forward the gift card to the recipient via email, or print it out. The gift card certificate can also be printed from the Frontdesk. An example of a the standard gift card certificate is shown below.